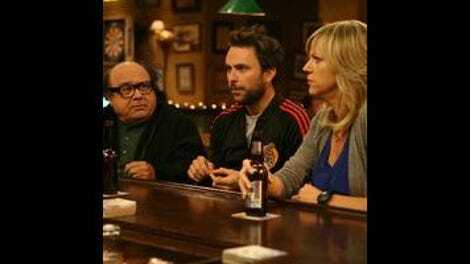 It's Always Sunny In Philadelphia: "Paddy's Pub: The Worst Bar In Philadelphia"
"Paddy's Pub: The Worst Bar In Philadelphia"
Donna's off in Denmark at a conference right now, so I'll be with you tonight to talk Sunny. Here's what I know about Denmark: Carl Dreyer, Lars Von Trier, those tasty cream-cheese-filled pastries, and–just a guess here–that there's nobody in the whole country as awful as the proprietors of Paddy's Pub. Or at least that's the premise–Denmark aside–of tonight's episode, an exceedingly slight bit of escalating farce that felt like the kind of "Let's just start the ball rolling and see where it lands" exercise that the Sunny gang would've trotted out in Season One. And I mean early in Season One. Because I like spending time with Sunny's core four–and because they've become a tight ensemble over the past few years–"Paddy's Pub: The Worst Bar In Philadelphia" was an entertaining enough 22 minutes, and occasionally even laugh-out-loud funny. But for the most part, the episode was as thin as the bar's new flat-screen TV. Let's start with that TV, just as the episode does. Purchased to class up the bar, the new flat screen instead looks out of place, and though Dennis would like to point to the TV–and the new Blu-Ray player, which Mac is perfectly happy to let dangle loosely from the set, lest it clash with the TV's narrowness–as proof that they're not white trash at Paddy's Pub, and that you won't get stabbed If you drink at Paddy's, and that if you ask the surly waitress for a chardonnay, she's won't bark, "Do you want me to bring you some lipstick with that?" Unfortunately, a local critic (played by Fisher Stevens, largely underused here) has just published a review that pretty much counters everything Dennis is trying to project. So what choice do they have? Charlie grabs his hammer, and soon Stevens finds himself duct-taped to a rolling chair, while the gang demands that he write a better review. Here's what I liked about this episode: the multiple shots from the inside of a car trunk, Tarantino-style; Mac trying to use his "cooling abilities," like Patrick Swayze in Road House (and Charlie responding to Mac's sloppy roundhouse kick by snapping, "Dude, take one karate class, if you're so into karate! "); Charlie eating a urinal cake to prove how clean the bathroom is (and Mac warning, "Dude, I just pissed in there, like 5 minutes ago"); Dennis and Sweet Dee kidnapping Stevens' neighbor because, "He started asking questions" (cue the kidnappee: "I asked one question! 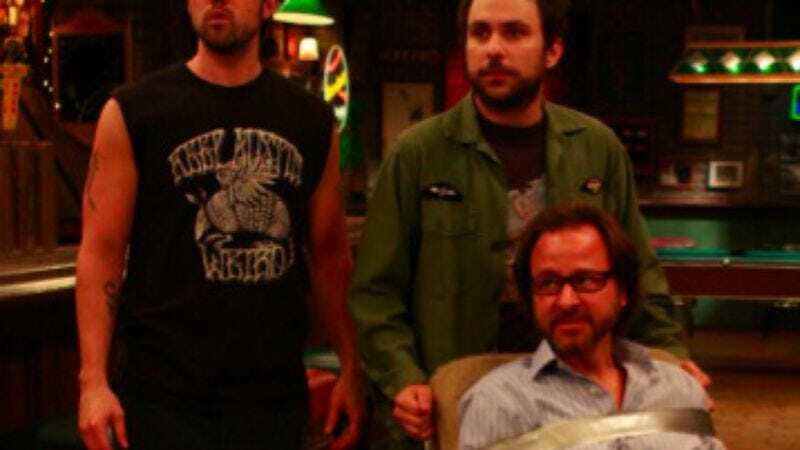 "); the gang harmonizing beautifully for no apparent reason; and all the business involving Mac and Charlie helping Stevens relieve himself, including Charlie sighing, "I was comfortable letting him piss in his pants," and Charlie wondering, "Did he get a little bit hard on us?" Like I said, these group of writer-actors has gotten good enough at their jobs that they can knock out funny moments even when there's not much to work with. Still, the outrageousness felt a little vanilla to me tonight, and for the first time these season, I've started to wonder if the Sunny team is getting tapped. But then, I'm a critic, and you know what Charlie says about critics: We judge people with our words. -"Now a diabetic cat is in play?" -When I interviewed the Sunny creative team prior to the start of the season, I got the idea that they were all working under extraordinary pressure and time constraints. I think this season has been good, by and large, but it's rarely been inspired. I'm wondering if the rushed production schedule has anything to do with that? -Next week: Sinbad and Rob Thomas, plus Dee attempts stand-up comedy. My hopes are high.